22 JANUARY 2008, PHILADELPHIA, PA—The Greek traveler, Pausanias, living in the second century, CE, would probably recognize the spectacular site of the Sanctuary of Zeus at Mt. Lykaion, and particularly the altar of Zeus. At 4,500 feet above sea level, atop the altar provides a breathtaking, panoramic vista of Arcadia. What would surprise Pausanias—as it is surprising archaeologists—is how early that “beginning” actually may be. New pottery evidence from excavations by the Greek-American, interdisciplinary team of the Mt. Lykaion Excavation and Survey Project indicates that the ash altar—a cone of earth located atop the southern peak of Mt Lykaion where dedications were made in antiquity— was in use as early as 5,000 years ago—at least 1,000 years before the early Greeks began to worship the god Zeus. In addition, a rock crystal seal, bearing an image of a bull, of probable Late Minoan times (1500-1400 BCE) and also found on the altar, suggests an intriguing early connection between the Minoan isle of Crete and Arcadia, and bears witness to another chapter in what now appears to be an especially long history of activity atop the mountain. David Gilman Romano, Senior Research Scientist at the University of Pennsylvania Museum of Archaeology and Anthropology and a co-director of the Mt. Lykaion Excavation and Survey Project, spoke about the excavation, and recent discoveries, at a Museum event Wednesday, 30 January 2008 at 6pm. “Mt. Lykaion, Arcadia is known from ancient literature as one of the mythological birthplaces of Zeus, the other being on Crete,” noted Dr.Romano. “The fact that the ash altar to Zeus includes early material dating back to 3000 BCE suggests that the tradition of devotion to some divinity on that spot is very ancient. The altar is long standing and may in fact pre-date the introduction of Zeus in the Greek world. We don’t yet know how the altar was first used, and whether it was used in connection with natural phenomena such as wind, rain, light or earthquakes, possibly to worship some kind of divinity male or female or a personification representing forces of nature.” Below the altar in a mountain meadow is an ancient hippodrome, a stadium and buildings related to the ancient athletic festival that rivaled the neighboring sanctuary of Zeus at Olympia. Although the Sanctuary of Zeus at Mt. Lykaion, just 22 miles from the extensively-studied Sanctuary of Zeus at Olympia, has been well known since antiquity, no excavations had taken place there in a century. The Mt. Lykaion Excavation and Survey Project, begun in 2004 with the first seasons of excavation work in 2006 and 2007, is a collaborative project of the Greek Archaeological Service, 39th Ephoreia in Tripolis, the University of Pennsylvania Museum of Archaeology and Anthropology, and the University of Arizona, under the auspices of the American School of Classical Studies at Athens. David Gilman Romano of the University of Pennsylvania Museum co-directs the project with Michalis Petropoulos of the Greek Archaeological Service in Tripolis, and Mary Voyatzis of the University of Arizona. High in the Arcadian mountains, the sanctuary at Mt. Lykaion was well known in antiquity as one of the most famous Zeus shrines in ancient Greece, as well as a site of early athletics in honor of the Greek’s greatest god. The site, which features an ancient hippodrome, a stadium and buildings related to the ancient athletic festival that rivaled the neighboring sanctuary of Zeus at Olympia, is known to have served as an important Pan Arcadian as well as Pan Hellenic Sanctuary that attracted pilgrims, athletes and dignitaries from all over the Greek world from the Archaic period to the Hellenistic period, ca. 700-200 BCE. Last summer, a small excavation trench in the altar yielded Early, Middle and Late Helladic, ca. 3000-1200 BCE pottery sherds, indicating activity in this region from as early as 3000 BCE. The new material creates a vastly different account of the history of the altar and the site. 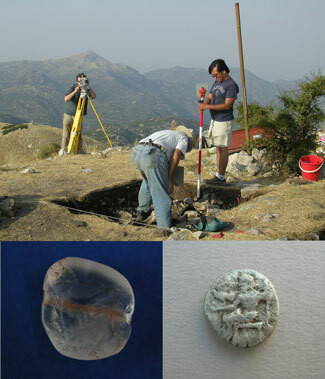 The intriguing discovery of one rock crystal lens-shaped seal bearing the image of a bull with full frontal face, likely of Late Minoan I or Late Minoan II date (1500-1400 BC), has, as of yet, no related materials to accompany it—but it does show at least some early connection between the two cultural areas. Early 20th century excavations of the Greek Archaeological Society at the altar suggested the earliest activity there to be about 700 BCE, and the Mt. Lykaion Excavation and Survey Project excavation found much evidence for activity in later periods: pottery and objects from the Geometric, Archaic, Classical and Hellenistic periods (900-200 BCE), including miniature vases, bronze tripods and rings, iron blades, an iron spit, and silver coins, were excavated from the trench. Several ancient authors mention that human sacrifice was practiced at the altar of Zeus—Pausanias alludes to mysterious sacrificial practices in his Descriptions of Greece—but to date, no evidence has been found. A considerable amount of animal bones was recovered from the altar excavations, with analysis underway, but preliminary results indicate large and small animal bones of various kinds, and no human bones. Top: Altar of Zeus at Mt. Lykaion. Left to right: Dan Diffendale, University of Pennsylvania, Dr. Arthur Rhon, Wichita State University, and Arvey Basa, University of Arizona. Bottom Left: Crystal lentoid seal of a bull, Late Minoan I or II, ca. 1400 B.C. Diameter 3 cm. Bottom Right: Reverse of Arcadian League silver stater, Zeus Lykaios seated on a throne with an eagle in his left hand. 5th century B.C. Diameter 2 cm.